Commuters on bikes beat those catching replacement buses to Melbourne's CBD by more than two hours as rail disruptions caused commuter chaos this morning. 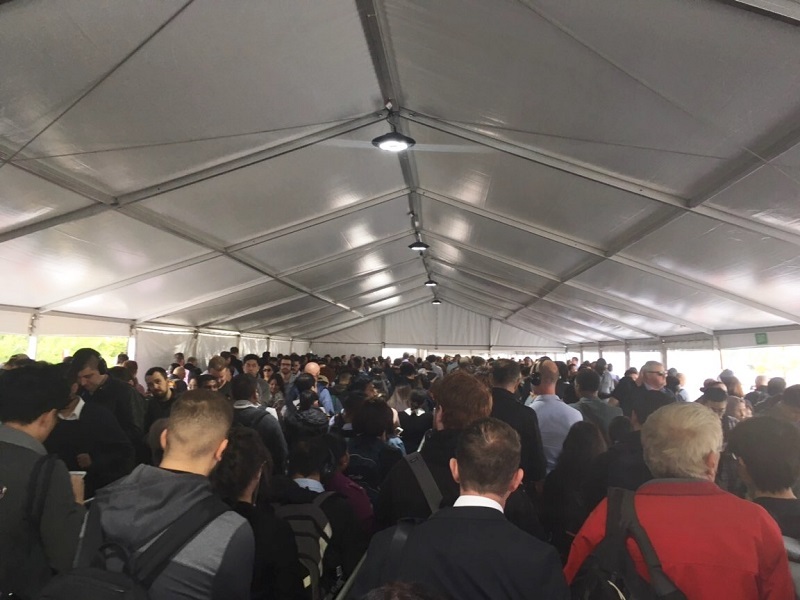 Bicycle Network’s commuter race from Oakleigh station to Flinders Street station showed that riding a bike is the best way to avoid delays during the Victorian government’s autumn rail blitz. Bicycle Network team members set off from Oakleigh station at 7:30am with the aim of making it to the city by 9:00am. One commuter rode a bike to East Malvern station on the Glen Waverley line and another rode the full distance to the city. A control commuter caught a train from Oakleigh station to Caulfield station and then a replacement bus from Caulfield to the city. The winner of the race was Bicycle Network CEO Craig Richards and team member Glen Janetzki who rode from Oakleigh station to the city in 47 minutes and 1 second. Not far behind Craig and Glen was Alexander Miller who rode from Oakleigh station to East Malvern station, parked his bike in a Parkiteer cage and caught a train to Flinders Street. It was a 15-minute trip from Oakleigh station to the platform at East Malvern. He walked down the Flinders Street station steps just 48 minutes and 31 seconds after riding away from Oakleigh station. The trip wasn’t so smooth for control commuter Grace van der Merwe who touched on her Myki at Oakleigh at 7:30am. 2 hours and 49 minutes later she arrived at Flinders Street station. Grace was unable to board the first two trains that stopped at Oakleigh because they were already too full. She squeezed onto the third train and travelled to Caulfield when the delays really kicked in. It took almost an hour to be funneled through marquees that led to the bus boarding area. After boarding the bus at 9:03am, Grace was able to get off at the Arts Centre just after 10:00am and walk to the Flinders Street steps. Bicycle Network CEO Craig Richards said the race showed that riding a bike is a great way to avoid frustrating delays as trains are out of action in April. 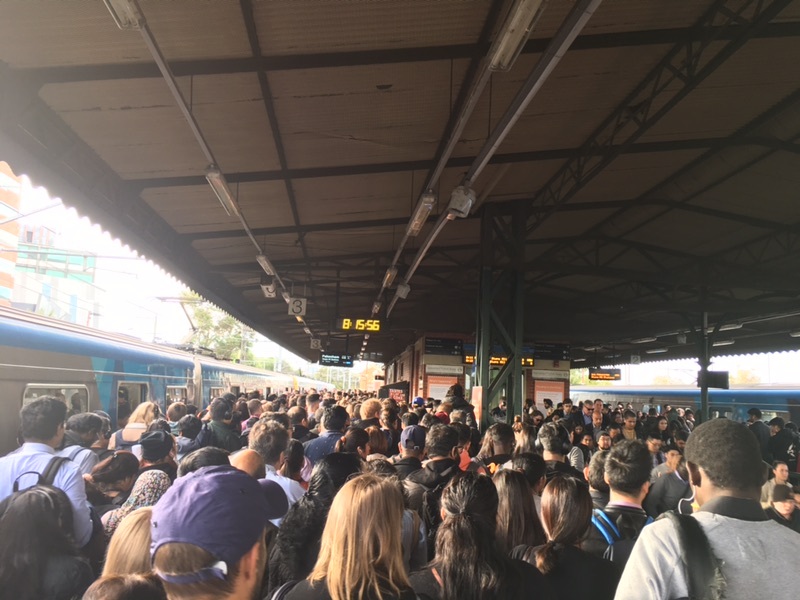 "Almost three hours to travel from Oakleigh to the city is far too long and the marquees at Caulfield station looked more packed than the ones you see at the racecourse." Commuters who are interested in riding a bike to avoid public transport delays are invited to contact Bicycle Network who will help them get riding. "Just give us a ring or visit bicyclenetwork.com.au and we will be able to help you get access to secure Parkiteer cages, show you off-road riding routes and give you other tips and information," added Mr Richards. The Cranbourne, Pakenham and Frankston lines are most affected by the rail blitz, but there is an excellent network of off-road riding routes that connect the line to the city and nearby Glen Waverley railway line. The Djerring trail that runs under the Caulfield-Dandenong skyrail connects to the Scotchmans Creek trail, Gardiners Creek trail and Main Yarra Trail. Click here to see a riding map from the Cranbourne/Pakenham/Frankston line to the city via the Glen Waverley line. Click here to read more about Bicycle Network's plans to help commuters during the rail blitz.